Review of July Beauty box. 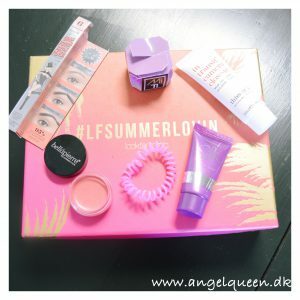 Ja selv om August Beauty box er lige på trapperne, har jeg i stedet valgt at teste produkterne fra Juli over en lidt længere periode inden jeg gav min anmeldelse af produkterne. Normal plejer jeg at skrive indlægget kort tid efter Beauty boxen er landet på min toilethylde. Men jeg har besluttet mig for at jeg fremover først vil poste min anmeldelse når jeg har haft testet produkterne over længere tid. På den måde kan jeg give en bedre anmeldelse om hvilke produkter jeg eventuelt er blevet tosset med og hvilke produkter jeg eventuelt vil købe frem over. Jeg tror det vil være sjovere at læse, fordi du selvfølgelig kan læse de rosende ord om produkterne på Look fantastics hjemmeside. Og har jeg kun testet produkterne en enkelt gang, kan jeg kun skrive lidt om hvad de lover og min udmiddelbare vurdering. Jeg har to favorit produkter i denne Beauty box. This Works, in transit camera close-up, som er en primer og fugtighedscreme. Victoria Beckham sværger til dette produkt, og jeg må sige at efter at have brugt This works hver eneste dag siden den landede, at jeg kan godt forstå Victoria Beckham. Cremen er super lækker og trænger hurtig ind i huden. Det føles lidt som om den strammer huden op samtidig med den er den perfekte base til makeuppen. This Work – in transit camera close-up, den ene af mine favoritter. Benifit, Goof proof eyebrow pencil, som er et helt nyt produkt. Blyantens skrå facon sikre at jeg hver eneste gang kan tegne mine bryn perfekt op. Spidsen er perfekt til at tegne eventuelle huller i brynene op. Jeg elsker Benifit, Goof proof eyebrow pencil og den er den anden favorit. NUXE, huile prodigieuse or, som er en glimmer tør olie der både fugter og giver en smuk glød. Olien er lækker og perfekt til den smukke glød on the go, eller hvis du skal gå fra Day to Night i en fart. Olien er blevet fast inventar i min makeup pung som jeg altid har med mig. KEBELE, silk anti-frizz cream setup, som er en hår creme der giver silke blødt, glat og glansfuldt hår. Cremen hjælper også med at reducerer hårtørrer tiden, hvis cremen masseres i håndklædetørt hår. Mit hår er i forvejen super glat og blødt derfor er det ikke en creme jeg kommer til at bruge meget. Bellapierre,lip and cheek stain, som er både løbebalsom og cremet kindrødt i en og samme bøtte. Jeg er vild med produkter der kan anvendes på mere end en måde og derfor er Bellapierre,lip and cheek stain også fast produkt i min makeup pung jeg har tasken. Det er skønt at være beredt til alle situationer. MITI, bobbles, som er de her super smarte hår elastikker som ikke efterlader mærker i håret på samme måde som almindelige elastikker. Jeg anvender MITI, bobbles hver nat, for at undgå at have hår i ansigtet når jeg skal sove. Jeg syntes faktisk også løst hår kan stikke når man skal ligge og sove. Desuden er det mest skånsomt for det lange hår at det blive sat op når man skal sove. Naturligvis indholdt Beauty boxen også det nye nummer af Elle, som altid er springfyldt med lækker inspiration til nye looks. Som du ved prøver jeg at style de nye looks med de items som jeg allerede har i mit closet. Derfor er det dejligt med frisk inspiration hver måned. Hvis du også gerne vil have fingre i den lækre Beauty box, kan du læse mere her. Review of July Beauty box. Yes although it is August, I have instead chosen to test the products from July over a slightly longer period of time before I gave my review of the products. Normally, I usually write the post shortly after the Beauty is box landed on my bathroom shelf. But I’ve decided that I now will not post my review before I have had the time to test the products over a longer periode of time. In that way I can give a better review about what products I may have been fallen in love with and what products I possibly will buy. I think it will be fun to read because you obviously can read the words of praise for the products on the Look fantastics website. And if I have only tested the products once, I can only write about what look fantastic promise and my has immediate assessment. I have two favorite products in this Beauty box. This Works, in transit camera close-up, which is a primer and moisturizer. Victoria Beckham swear by this product and I must say that after using This works every day since it landed, that I can understand Victoria Beckham. The cream is super delicious and penetrates quickly into the skin. It feels a bit as if it tightens up the skin while it is the perfect base for makeup. This Work – in transit camera close-up, is one of my favorites. Benifit Goof proof eyebrow pencil, which is a brand new product. Pencil slanted shape ensure that I every time can draw my eyebrows up perfectly. 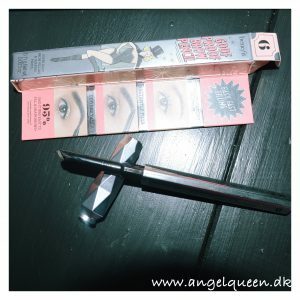 The tip is perfect to draw any gaps in the eyebrows up. I love benifit Goof proof eyebrow pencil and it is the second favorite. NUXE, huile Prodigieuse which is a glimmer dry oil moisturizes and gives a beautiful glow. The oil is delicious and perfect for the beautiful glow on the go, or if you need to go from Day two Night in a hurry. The oil has been a fixture in my makeup purse that I always have with me. Kebele, silk anti-frizz cream setup, a hair cream that provides silky, smooth and shiny hair. The cream also helps reduce hair meantime, if the cream is massaged into damp hair. My hair is already super smooth and soft so it is not a cream I get to spend much. Bella Pierre, lip and cheek stain that is both lip balsame and creamy blushes in one bin. I love products that can be used in more ways than one and therefore Bella Pierre, lip and cheek stain ia a solid product in my makeup purse I have in my bag. It’s wonderful to be prepared for all situations. MITI, bobbles, that are these super fancy hair elastics that do not leave marks in the hair in the same way as ordinary rubber bands does. I use MITI, bobbles every night, to avoid having facial hair when I sleep. I actually think that loose hair can sting when you have to lie down and sleep. Moreover, it is the most gentle with long hair that it to be set up when you have to sleep. Naturally the Beauty box also contained the new issue of Elle, that is always filled with delicious inspiration for new looks. As you know, I try to style the new looks with the items that I already have in my closet. Therefore, it is lovely with fresh inspiration every month. If you also want to get your hands on the delicious Beauty box, you can read more here. 50plusandfabulous, Angelqueen, AngelQueenBlog, Angelwings, Blogger, chicat50plus, classy, clothes, clothing, colorful, danish, Dress, facebookpage, fashion, fashionable, fashionblogger, fashiondaily, fashionista, followme, girl, hair, heels, highheels, instafashion, Jewelry, July Beauty box, loveit, makeup, modern, musthave, necklace, ootd, outfit, photooftheday, photoshoot, picoftheday, Review of July Beauty box, Shoes, Style, styleangel, styleblogger, tagsta, tagsta_fashion, trendy, womensfashion. Bookmark.